Last year Sarah introduced me to the KNORK. Ok, maybe that’s overstating it a bit, but we still love and use our KNORKs every day in our house. 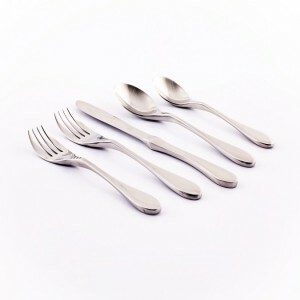 For the uninitiated, KNORK flatware is finely-crafted, heavy and durable. The fork is kind of a combination of a fork and a knife, which is amazing for those of us with only one hand. Like I alluded to earlier, though, our whole family loves them and all the rest of those weirdos have two hands. Long story short: No matter how many hands you have, if you value quality kitchen utensils, KNORK is for you. Watch this video I made to see me un-box my set and use them. It’s super dorky, but my reaction is genuine. Anybody here into early Christmas or Haunakuh presents? 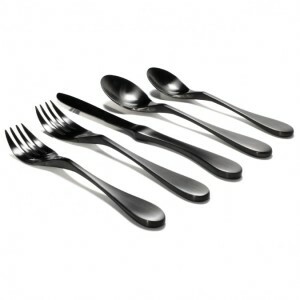 First of all, BRAND NEW to the KNORK line-up, I present to you the BLACK MATTE TITANIUM flatware! It’s unbelievable. What I’m even MORE excited to offer you is the chance to win a FREE 20-Piece Glossy Set OR 20-Piece Top Chef Set! There are several ways to enter the Rafflecopter giveaway and you can do many of them EVERY DAY, racking-up more entries every time! Enter, share and cross your fingers! Good luck! P.S. Obviously, I got mine for free, but I’d tell you if I hated them. Seriously. And I don’t get anything if you buy them, so I’m not just hocking you some junk to make some paper. I really do like them and think you will, too. Knorks look so cool! Would love to try them!!! 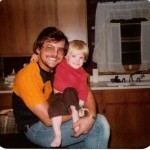 I’m so excited about this, I just used my first-ever tweet to promote it! we could use some great durable flatware as we travel and move to Africa. 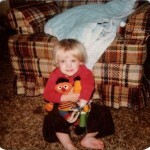 Also my daughter has upper limb loss, missing part of her left arm and hand. I have the knork forks, and I really like them. If I hang around long enough and keep entering, maybe I’ll win one of these times! Would love to have a set for my son who has limb differences which affect both hands. My son is a mirror image of you, Ryan. He’s 13 and about tired of his mommy cutting his food for him. 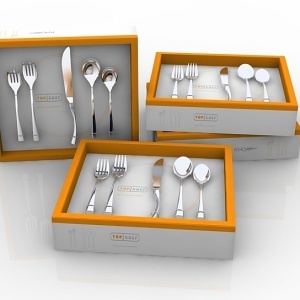 A set of Knork flatware would make an awesome gift for him! My 3 yr old son is just learning to use cutlery and with his little hand it is hard for him to cut using a knife. Hoping to win this and see if it helps him. Thank you. 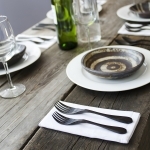 I have enquired at the Independant Living Centre in Australia and they have the fork available. Depending on the price I may bite the bullet and order a set from the US. This silverware looks gorgeous. My son would really like this. It’s interesting the things that can be tricky one-handed. Yet there are always good ways to work around it. Thanks for sharing. I would love to give this to my stepson for Christmas!!! I would love a set of Knorks for either of my kiddos who eat one handed! What cool forks! My son is living one handed too & is almost 5. He’s learning how to use utensils & these would be awesome tools for him. Ordered my daughter the sample salad fork! She can’t wait to try it! This instantly made me smile because I have my significant other cut up my food all the time. I hate trying to cut through with forks, it kills my fingers! But since I was born one handed I have just managed and dealt with it. It sounds crazy but I would take this to restaurants even! When I heard you chuckle when the knork hit the plate and went right through the pizza, I knew it was something super helpful. I have had that feeling before. Anyways, I really want a set!!!!!! I would love this set for my son who has a lucky fin. It would really help him a lot to cut his own food on his plate and help create more independence. This looks great and I would love to introduce them to my son who is one-handed. Suggestion: At restaurants I ask for my meat to be sliced for me. ‘Sliced’ is the word; not ‘cut up’. Sliced means you end up with slices of meat like a roast which is much better to deal with. I would suggest trying this at home as well.